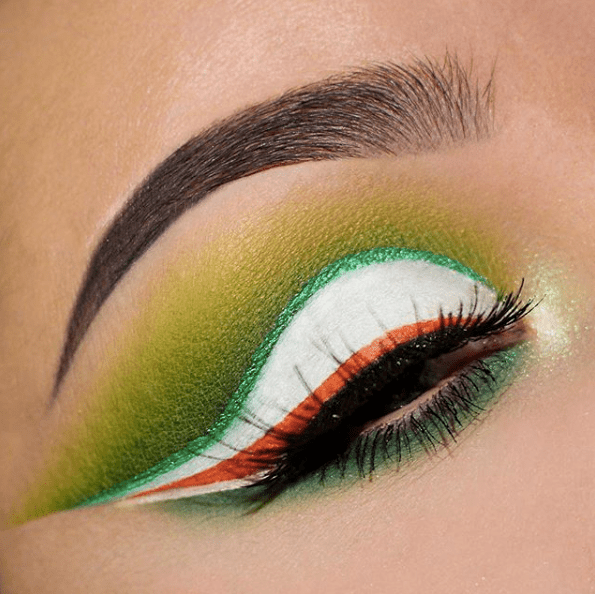 It is time to start thinking about St Patricks Day makeup looks! It was Christmas just yesterday, but here it is in March. The most inspiring season is coming. Spring over the horizon, and the weather is getting warmer and the day is getting longer. If you’re in St. Patricks Day mood. 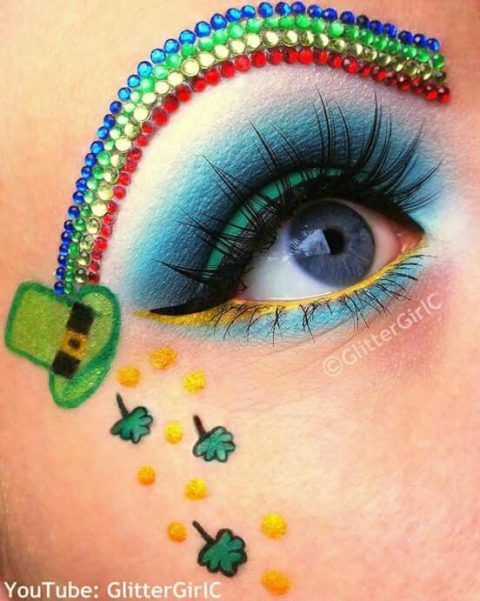 If you are looking for any ideas for St. Patricks day makeup we are here to help you. 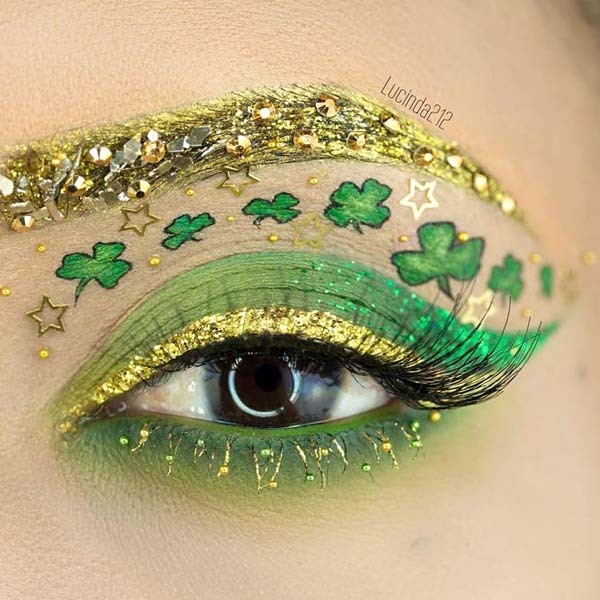 Our ideas for St. Patrick day makeup look will meet all you requirements. We promise to make that day special for you with this unique makeup looks. From light and bright to darker and heavy, there’s a look to meet everyone`s requirements. It is such an amazing look, isn`t it? 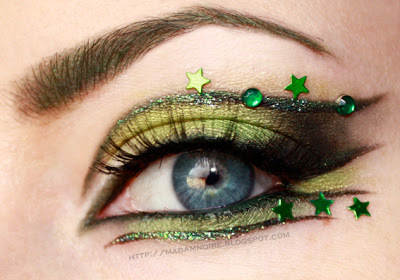 This St. Patrick day eye makeup promise you a great day at that special event. This look would be perfect. It’s got the green Irish theme, a rainbow, the leprechaun at the end … or at least, his hat! 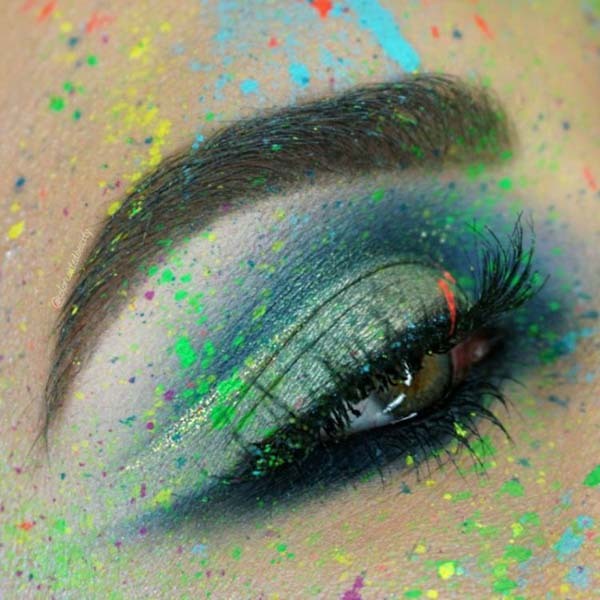 This fresh idea for a makeup is full of colors. If you like being extravagant and enjoy colorful impression, so go for that idea. It’s a brave decision, isn’t it? 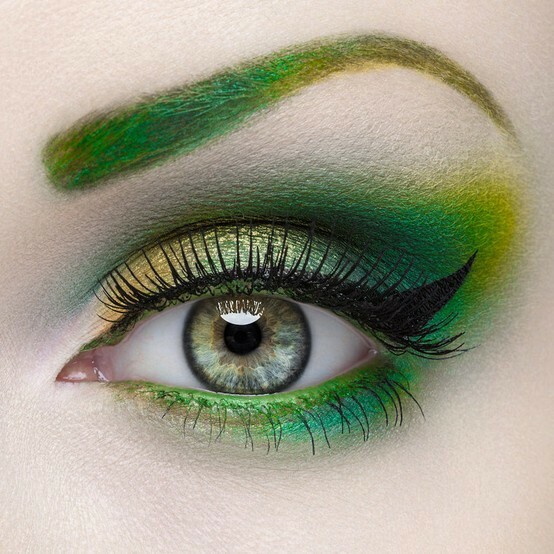 Yellow and green eye makeup …such a brave combination. We have never thought of it before, but after seeing this stunning bright look, we’re converted. The most important thing is to build up the color gradually. This is a look you’ll want to blend and build. If you have some time to yourself one day, why don`t you practice it. 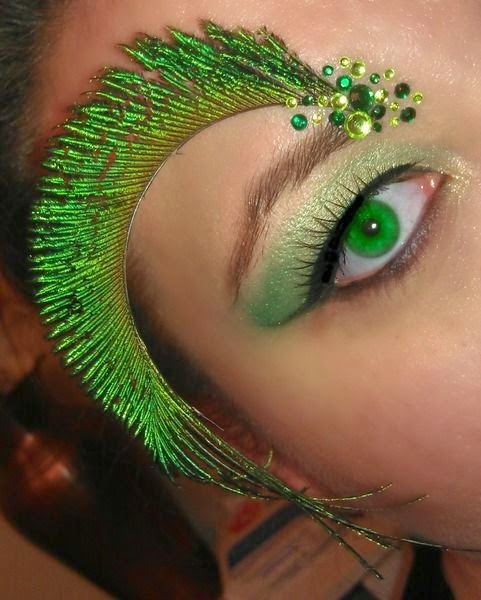 It is again another fresh idea of St. Patrick day face makeup. Here we have the usual green in a brave combination with silver. The silver color is in the inner angle of the eye. The effect is like tears. It reminds of a thunder flash. 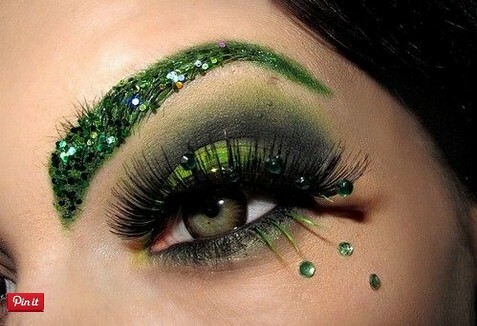 When you want to emphasize on the green color to your St. Patrick’s Day makeup looks, add green gems. If you want to achieve a shiny effect even brighter than a diamond, adding something that looks a bit like diamonds is the only way. And most of all they’re green – green is what St. Paddy’s Day is all about! 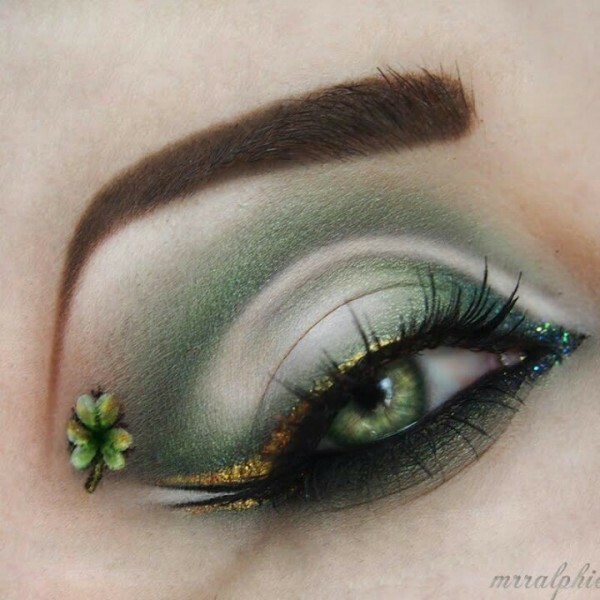 You can’t get a St. Patrick’s Day celebration without a shamrock, and that’s why we fell in love with this amazing green look. There’s green and glitter and then we have those funny clover designs. They’re not so difficult to hand paint. Just try at home alone in the mirror and enjoy the effect. Of course, if you’re going to impress you need the lashes to go with it. If you have the time to spare, and hate trying to apply your own false eyelashes as much as we do, there are salons up and down the country with false eyelash extensions technicians. If you want to dedicate to the cause, you’ll be astonished at how perfect they look, and how long they last too! 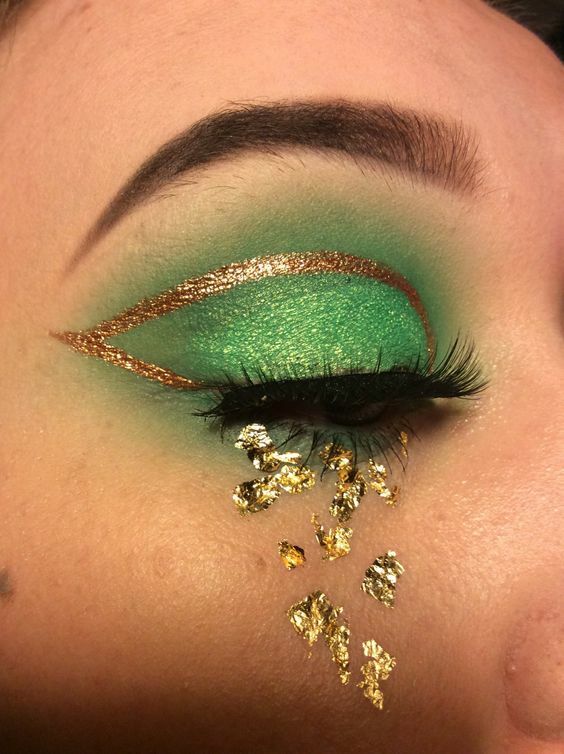 This St. Patrick`s day look makeup is the art of the arts. There is so much green in it. You can also use green crystals to reflect the light. Just for the entire look of this amazing makeup you need a makeup artist. You have to spare time in visiting the nearest salon but the time invested will not be in vain. You will be the most impressive girl at the event. You can get lots of inspiration to come up with your own new and unique looks. To work out this makeup requires skills and imagination. 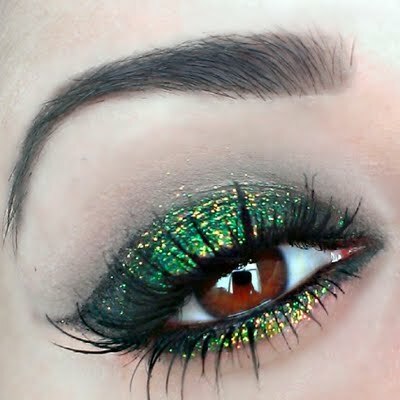 The fifty shades of green give you that deep look that grabs the attention. And all that four leaf clover all around remind of the special event. A sight full of luck and glamour. Wow, this is a look that really pops. 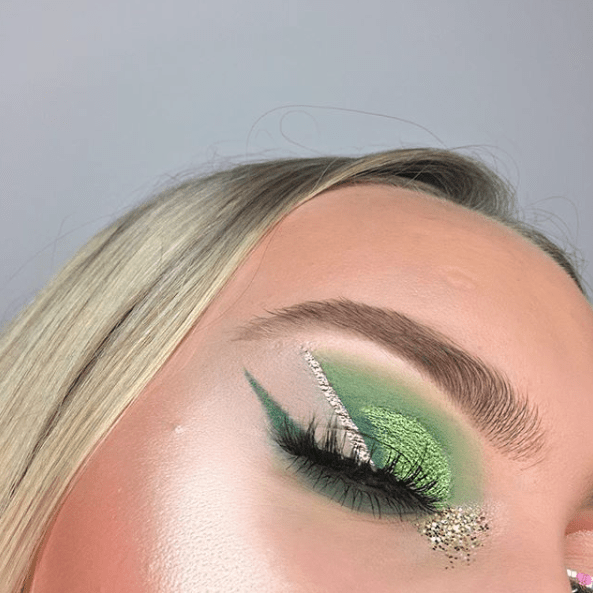 If you want an easy way to wear green, this light green and gold St Patrick’s Day makeup looks is one of the most appropriate ones. It’s easy to be done and also suitable for both day time and night time events. 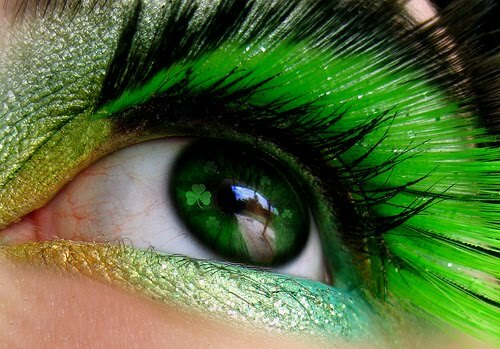 So, you’re celebrating St Patrick’s day this year, we reckon makeup that will just fit the bill. When you use colors be aware of. The combination should be clever and strategical. 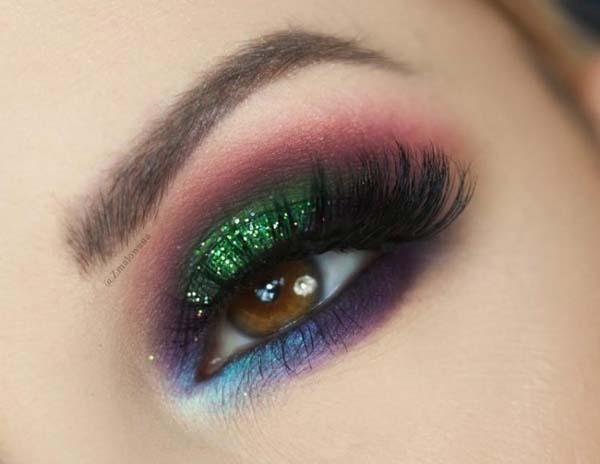 Rather than opting for a green lid all over, go for a green smoky eye instead. You have the opportunity to make the look discreet by using a darker shade to help dull things down, and you’ll find that green hue is much easier to wear. Just because you said green it doesn’t mean that you should go for bright green. It is amazing and extremely brave combination of green and not so typical red. The effect is as fresh as water melon. Being unexpected in that unique style you will attract attention and become unforgettable. Just fabulous with that feather in green. Like a male bird to impress the female. Adding this attribute will give you advantage among all the other art looks of makeup. Just try that special style and you will see how unforgettable your appearance will be. Green eye brow and a lash to impress. So go for that idea. 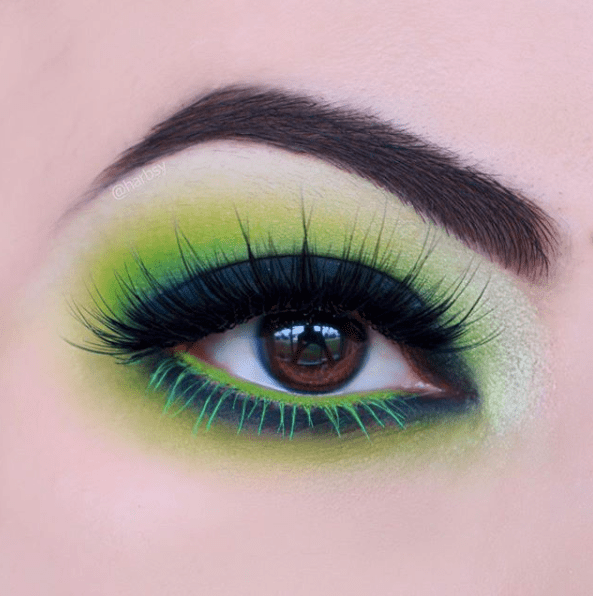 Green but gentle with that lash. And the shade of yellow gives more sunshine in your eyes. This makeup is more extravagant. It bravely combines gold and silver. It is appropriate for girls and young ladies. Even the lash is gold. There are hand painted clovers just to remind for the lucky event. 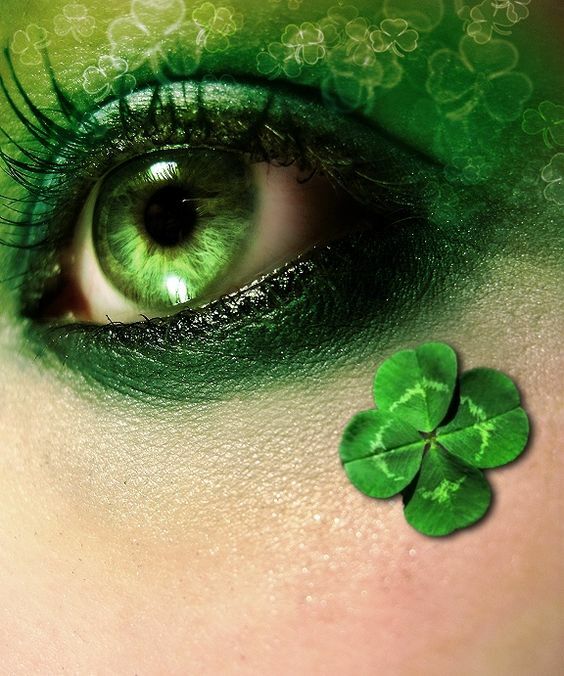 You are wishing for a bit of luck this St. Patrick’s Day? 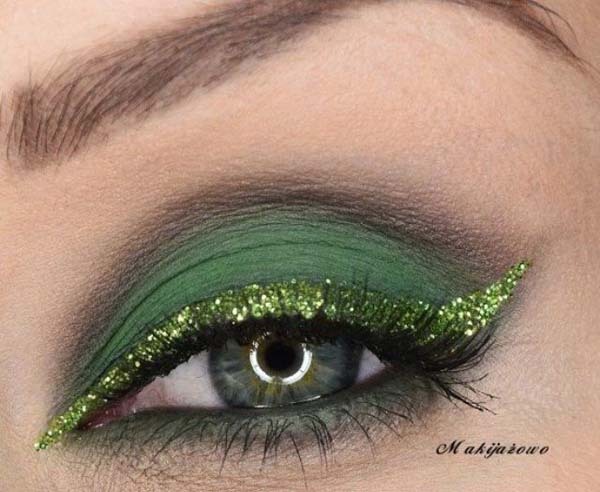 Then you should bring together the best of the St. Patrick’s Day colors with this green and smoky look! Well if you don’t receive good fortune, you should not to worry, I’m sure you’ll be receiving tons of attention for this look! A little bit a romance. It is Sp. Patrick day. So, why don`t you be different. It is difficult to do it at home but it deserves to spend some money and time in an art salon. It is not only an easy makeup but also very attractive. There is a thin lash also. 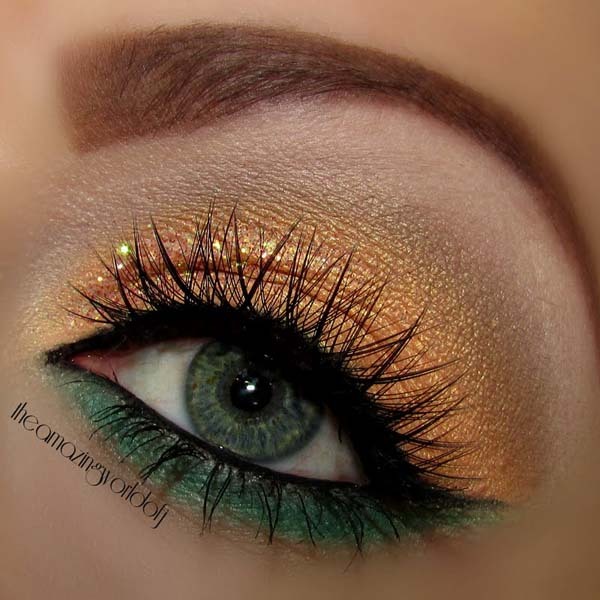 The gold gives this special effect of a shiny eye that reminds of a celebration. 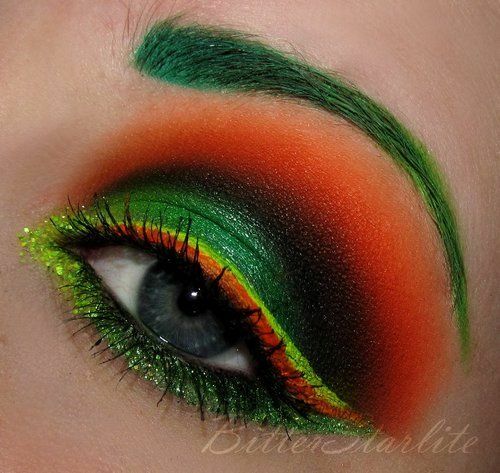 Just to make that day of the year really special you can attract tones of attention by wearing this St. Patrick`s makeup. It is appropriate not only for a day but also for a night event because of it smoky effect. Who says that only green can be used. This combination with shades of purple and green is really brave. This purple color gives that mysterious look that will make you unforgettable at that special occasion. If we’re getting into the swing of things, we’re really getting into the swing of things. 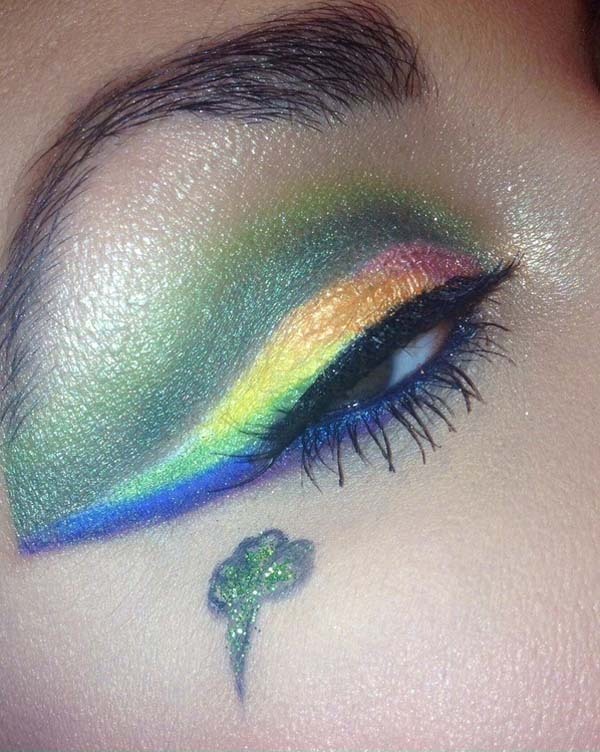 We’re going all-out with rainbow-green St Patrick`s day makeup like this one. The base is green and blue. Then just close your eyes and get splat-tastic. It’ll be lots of fun while making this artistic makeup. This makeup is unique because of it artistic look. It is St. Patrick so it is time to celebrate the colors. This is the right time of the year when you can be brave in all combinations in colors and artificial ads. Easy and quick if you are good at drawing a lash on your eye. If you are not you can spend some time and money for going to a salon but you will not feel sorry about. Who ever said that blue and green wouldn’t work well together? 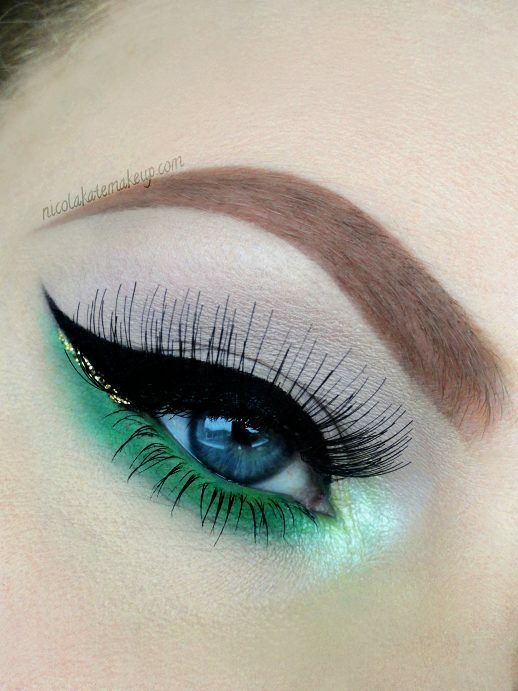 We think this blue and green combo for St. Patrick’s Day makeup looks is amazing, and almost rainbow-like too. It all goes perfectly with that Irish St. Paddy’s day theme!